Some examples of the use of remote sensing for agricultural applications are discussed in this section. Many of the examples have been taken from the Australian situation. Additional information is available in White, Tupper, and Mavi (1999). Vegetation cover is important as an indicator of available fodder and to protect the soil resource from erosion. 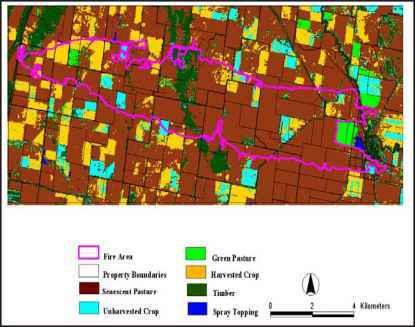 Cover can be estimated using remote sensing, field measurements, pasture and crop models, and farm survey data. Remote sensing has been used to assist in assessing the severity of drought across Australia, current satellite imagery being compared to that of previous years. It has also helped in determining the spatial extent of exceptional droughts (McVicar and Jupp, 1999). Another valuable use is in aiding the validation of temporal (including temporal/spatial) agronomic models, as has been incorporated into the National Drought Alert System known as Aussie GRASS (Australian Grassland and Rangeland Assessment by Spatial Simulation) (Brook and Carter, 1994; Wood et al., 1996). 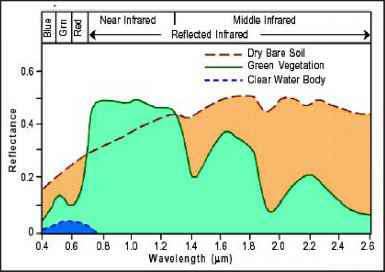 The most commonly used measure of vegetative cover has been the Normalized Difference Vegetation Index (NDVI), which is based on differences in reflection of red and near-infrared (NIR) light. 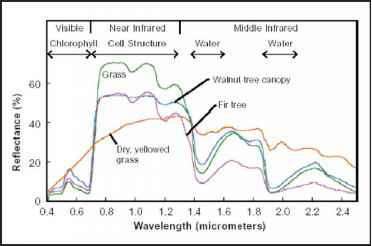 Chlorophyll pigments in leaves absorb red light, and changes in leaf structure can influence NIR reflectance. Foliage presence, as measured through the leaf area index, can be related to NDVI. LAI is m2 leaf per m2 ground. Thermal data, trans formed to the Normalized Difference Temperature Index (NDTI), are also of value in assessing vegetative cover and drought monitoring (Bierwirth and McVicar, 1998). The Advanced Very High Resolution Radiometer (AVHRR) on the polar-orbiting NOAA satellites is a major tool used for vegetation monitoring. Other platforms include the polar-orbiting U.S. Landsat and French SPOT satellites. The NOAA, Landsat, and SPOT satellites orbit at about 700 km altitude. As a service to the agricultural and environmental sectors, the CSIRO Division of Marine Research produces a composite NDVI image of the whole of Australia every two weeks using data obtained from the Australian Centre for Remote Sensing (ACRES). A two-week compositing period is used to minimize cloud cover in the data. The composite images have a resolution of 1 km. 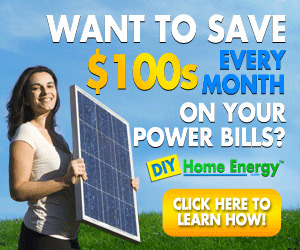 They are made available to customers about ten days after the end of the two-week period. Historical data are also available going back to 1991. AVHRR data are recorded and archived daily within the Bureau of Meteorology Research Centre (BMRC). A compositing pathway has been established using these data. To highlight changes in the monthly maximum value composite NDVI between sequential months, the Maximum Value Composite Differential (MVCD) has been developed (Tuddenham et al., 1994; Tuddenham and Le Marshall, 1996). The MVCD is based on the difference between two images recorded at approximately two-month intervals, with a log stretch to enhance the subtle difference in the NDVI signal that has occurred over that time. The changes may involve either a browning or greening of the vegetation cover during the two-month period. This can be useful to identify whether a season is atypical in terms of the timing of either seedling emergence or herbage drying off. More information can be found at the Web sites for the Bureau of Meteorology <http://www.bom. gov.au/nmoc/NDVI/> and Environment Australia <http://www.ea.gov.au/ land/monitoring/>. where T^ is a modeled surface temperature if there is an infinite surface resistance, that is, ET is zero; Ts is the surface temperature observed from the AVHRR sensor; and T0 is a modeled surface temperature if there is zero surface resistance; hence ET equals ETp. 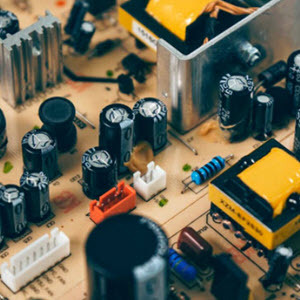 Tw and T0 can be thought of as the physically limited upper and lower temperatures, respectively, for given meteorological conditions and surface resistances. They define a range within which meaningful AVHRR surface temperatures must fall. If Ts is close to the T0 value, it is an indication of conditions being "wet," whereas if Ts is close to the Tm value, dryness is indicated. Tw and T0 are calculated through the inversion of a resistance energy balance model. 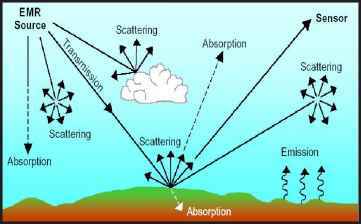 The parameters required at the time of satellite overpass are meteorological- and vegetation-related parameters. Required meteorological data include air temperature, solar radiation, relative humidity (or some other measure of vapor pressure), and wind speed. However, many meteorological stations record only daily air temperature extremes and rainfall. 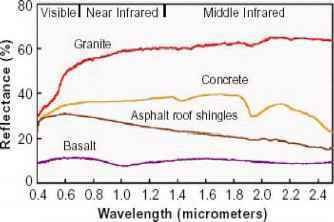 McVicar and Jupp (1999) have tested and extended strategies to determine air temperature, solar radiation, and relative humidity at the time of the satellite overpass. 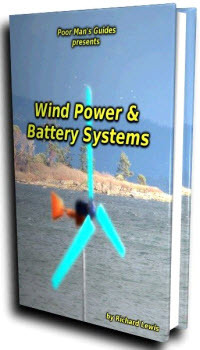 Wind speed can be obtained from daily wind run data, if available, or long-term climate surfaces. Vegetation parameters, mainly LAI, are obtained from reflective data. For four dates in 1995, in cereal cropping and pasture environments in Victoria, relationships were developed between 1 m2 in situ LAI measurements and the planetary-corrected albedo Landsat TM simple ratio (McVicar, Jupp, Reece, and Williams, 1996). These relationships were then used to scale the TM simple ratio to provide estimates of LAI at a 30 m2 cell size for an entire TM scene. These data were then related to AVHRR simple ratio with a resampled cell size of 1 km2 (McVicar, Jupp, and Williams, 1996). Hence 1 m2 measurements of LAI were scaled to 1 km2 estimates of LAI by using TM data as the intermediate scalar. For wooded areas 30 m2 field sites were established and LAI measured, which was subsequently related to AVHRR vegetation indexes (McVicar, Walker, et al., 1996). This enables AVHRR reflective data to be scaled to estimates of LAI for cropping and pastures (McVicar, Jupp, and Williams, 1996) and wooded vegetation (McVicar, Walker, et al., 1996). Hence, the NDTI is calculated at the points, which are sometimes separated by distances of 500 km, where meteorological data are recorded to support the calculation. AVHRR-derived NDVI and Ts are used as covariates to interpolate the NDTI away from the ground meteorological stations using a spline interpolation algorithm called ANU_SPLIN (Hutchinson, 1995). This results in NDTI images. This has been done for ten years of AVHRR data focusing on the Murray-Darling Basin in southeast Australia. The thermal data used in the NDTI calculations are affected by a few environmental parameters. The controlling parameter of the NDTI is the partitioning of the available energy into the latent and sensible heat fluxes. This partitioning is determined by the available moisture to be transferred to the atmosphere via ET. The amount of energy partitioned into the sensible heat flux is one determinant of the observed surface temperature. Consequently, the NDTI is more sensitive to changes in resource availability than the NDVI, which integrates the response of the environment to the resource. The NDTI has a greater ability to map the availability of water. This provides a measure of stress when plants are not yet responding to a reduction in chlorophyll content, thereby reducing the NDVI. More important is the ability of the NDTI to map moisture availability that will be influenced by rainfall that falls between meteorological stations. The NDVI will not be able to map these events with the same temporal resolution due to the time lag between rainfall and plant response. The aim of producing the NDTI is to allow insight into the regional water balance. ET being common to both water balance and energy balance model formulations achieves this. In water balance models ET is defined in terms of volume of water, usually measured as milliliters per day. 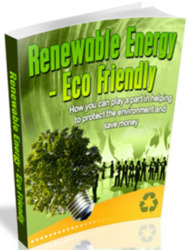 In energy balance models ET is defined in terms of energy, measured in watts per unit area. The water-balance-derived moisture availability can be used to determine the amount of net available energy (AE) at the earth's surface utilized by the latent heat flux. The remaining AE is partitioned toward the sensible heat fluxes. The sensible heat flux can then be physically inverted to provide a modeled surface temperature based on the water balance moisture availability, denoted, Ts WB. This can be compared to the AVHRR-derived surface temperature, denoted Ts AVHRR. 1994). This has been applied to the extensive rangelands of Western Australia (Cridland, Burnside, and Smith, 1994). Stocking density and when to muster are important issues, exacerbated by the size of individual paddocks. Pastoralists want to muster livestock only once a year. Having an indication of the available feed can assist in the decision of when to muster. Cridland, Burnside, and Smith (1994) analyzed the four years of NDVI data by plotting the NDVI signal as a time series. The height, in NDVI units, from a varying baseline to the maximum peak within the growing season is calculated. This green "flush" is the response of the landscape to rainfall. The baseline was varied to account for the influence of perennial cover on the NDVI signal. The baseline is defined as the minimum value from the previous year. The vegetation response or "flush" recorded as the maximum for a particular year is then considered relative to the absolute maximum "flush" within the four (or more) years of data. As well as indicating where and when grazing conditions are poor, both images may be used to highlight opportunities to increase stocking densities due to an increase in available feed. This can help place individual years within a historical context. DOLA is also engaged in monitoring bushfire activity in northern Australia, at a continental scale on behalf of the Environmental Resource Information Network (ERIN), and at a finer resolution for the Fire and Emergency Services Authority of Western Australia and the Bushfire's Council of the Northern Territory. The Queensland Department of Natural Resources and Mines also has a fire monitoring program. Fire without follow-up rain can be ecologically devastating, so fire control and hotspot monitoring are very relevant to managing for climate variability, this being particularly important in the savanna country of northern Australia. See <http://www. dola. wa.gov.au>, <http://www.eoc.csiro.au/>, and <http://www.LongPaddock. qld.gov.au/SatelliteFireMonitor/>. NSW Agriculture uses spatial information technology to assist in the management of agricultural emergencies including bushfire and flood (Tup-per et al., 2000). GIS, GPS, and remote sensing combine to add value to the outcomes of its emergency management activities. Northwestern New South Wales experienced major flooding during the La Niña event of spring 1998, which caused millions of dollars of damage to agricultural production and resources. NSW Agriculture needed to quantify the areas inundated by water to assist with planning for future floods and to validate current assistance programs. Various satellite data sources were investigated for mapping the flood. Data were required every few days, making temporal resolution an important issue. A multisensor approach using SPOT, Landsat, and Radarsat data could have produced accurate results at a property scale. The high purchase cost and high demand placed on human and computer resources for processing precluded the use of these data. NOAA AVHRR was a suitable alternative with six overpasses per day and its thermal imaging capability. Its 1 km spatial resolution was a drawback but was sufficient for regional-scale mapping. Data from all NOAA satellite numbers 12, 14, and 15 overpasses were obtained over the period, giving a total of 415 images. The thermal bands 3, 4, and 5 represented absolute temperatures in 1/100 of a degree, while reflected bands 1 and 2 represented calibrated reflectance values. Discrimination between land and water was best in the thermal bands in the predawn images, with water consistently 8 to 10oC warmer than land. This is because water temperature remains relatively stable throughout the diurnal cycle, whereas the soil surface is then at its coolest (Sabins, 1997). Over 5,000 km of rivers were mapped. The area inundated was 4.5 million hectares. There was good agreement between the maps derived from remote sensing and data from field surveys, with errors restricted to narrow rivers. NOAA AVHRR data were of no use for mapping narrow rivers or waterlogged soil. 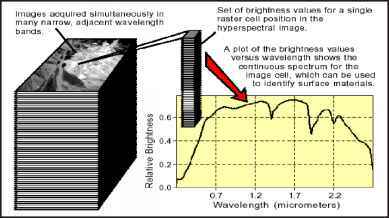 Higher spatial and spectral resolution imagery is required in these cases. In February 1999, a bushfire occurred in inaccessible country in central New South Wales. Major stock and property losses were incurred by landholders. Over 8,000 sheep were killed on 34 properties. The inaccessible nature of the area made determining the fire extent difficult for field staff. NSW Agriculture provided near-real-time monitoring of the fire over a four-day period. NOAA AVHRR data were chosen because they have high temporal resolution (four hourly) and good spectral resolution for active fire-front identification. These data were available within 50 minutes of the satellite overpass. The NOAA AVHRR was not designed for active fire monitoring and suffers limitations in terms of spatial resolution and radio-metric saturation. However, it proved to be suitable for this task (Setzer and Verstraete, 1994). Images were assessed individually using techniques and band combinations appropriate to the time of capture and the direction and extent of the smoke plume. Daytime images captured on the first day, when the fire was travelling northeast and the smoke was blown clear of the southern and western edges of the fire scar, presented an opportunity to map these edges using the visible and reflected infrared bands. On the third day, wind strength abated, allowing smoke to rise and remain above the scar, completely covering the area. 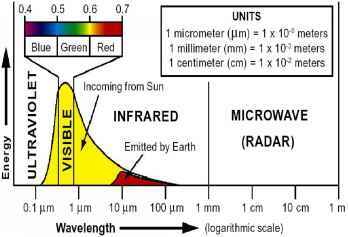 The wavelengths of band 3 (3.55-3.93 ^im) enabled identification of the fire front, even when the area was obscured by smoke. Unlike a cloud, which is impenetrable by radiant energy, smoke consists of very fine particles through which radiant energy can pass relatively unaffected (Sabins, 1997). Analysis of images when smoke was hanging over the fire was restricted to density slicing of band 3. This produced a clear picture of the active fire front. Nighttime overpasses were displayed (RGB 345) to produce clear images of the fire front and hotspots. GIS polygons were created by on-screen digitizing around fire fronts and, smoke permitting, fire scars for daytime overpasses. The creation of individual polygons enabled mapping of the total fire scar and the fire progression in four hourly increments. This technique provided field staff with access to maps of the fire's location in near-real time. In December 1997, a fire swept across open farming and grazing country in southern New South Wales. Major losses were incurred by landholders. Remote-sensing and GIS technology were used to quantify agricultural losses. Landsat TM data were chosen due to their low cost per unit area and good spatial and spectral coverage. The limitation of Landsat data in this case was their temporal resolution (16 days). Two consecutive overpasses were obtained. The overpass before the fire occurred on December 9, with the next on December 25. Given the rate at which cereal crop harvesting occurred, an image for the morning of the fire would have been desirable to assess unharvested crop losses. Furthermore, with 16 days between images, clouds can delay postfire image acquisition until it is too late. Satellite imagery needs to be obtained as soon as possible after a fire. Spectral separability of fire scars decreases over a relatively short period due to vegetation regrowth and removal of ash by wind and rain (Eva and Lambin, 1998). A simple differencing algorithm was applied, producing a seven-band difference image. Band 1 of the prefire image was subtracted from band 1 of the postfire image, and so on, for seven bands. Change bands were assessed to determine those that best differentiated the fire scar. Bands 2, 3, and 4 proved most suitable. This image was used to produce a polygon of the fire scar. The prefire image was classified to determine prefire land- cover types. The classes differentiated were harvested crop, unharvested crop, actively growing pasture, senescent pasture, and timber. Discrimination between improved and native pastures was not possible given the prevailing dry conditions. Using the classified image, fire scar polygon, and property boundaries, a GIS analysis was performed to extract which properties were affected by fire, the area of each property affected, and the area of each land-cover type lost on each property. The data produced through GIS analysis were reported in both map and tabular format (Figure 7.9). The Environmental Resources Information Network has, over a number of years, used a number of techniques to analyze changes in AVHRR-derived NDVI images. Recently all AVHRR data held by ERIN have been recalibrated using the method proposed by Roderick, Smith, and Ludwick (1996). A number of analytical tools have been used to interpret the NDVI data. Mapping the divergence of NDVI relative to the long-term mean has been done at two-month intervals. Having such a fine temporal resolution is important for data to be placed into a historical context, as it allows changes due to vegetation phenology, inherent seasonal changes in solar radiation, and air temperature to be normalized. This is important for determining the divergence from "normal" conditions for the particular month rather than using yearly extremes. The analytical approach of the "flush" which has been applied to Western Australia, and follows the idea of determining the flush of NDVI at a pixel level on an annual basis, will be applied to the entire Australian continent. See <http://www.ea.gov.au/land/monitoring/index. html>. Satellite-based information on vegetative cover is an important layer within a GIS devoted to monitoring seasonal changes in vegetation, land clearing, and the extent and severity of drought (Brook and Carter, 1994; Carter et al., 1996). Considerable emphasis has been devoted to field validation of NDVI data and model output with respect to pasture biomass and tree cover (Wood et al., 1996). Monthly NOAA NDVI satellite data are presented as decile (relative) greenness maps in the same manner as rainfall is often reported. A NOAA receiver is used for fire mapping. Common AVHRR processing software (CAPS) is used for postacquisition processing. Maps of fire scars are used to "reset" grass biomass in spatial models and to investigate fire frequency in grazed lands. Combining data on the area burned, with model biomass and nitrogen content, allows calculation of greenhouse gas emissions. NDVI and thermal data provide a high resolution (spatial and temporal) data set that can be matched to a synthetic NDVI produced by biological models. NDVI data were compared to a model's synthetic NDVI signal to independently validate the model, both spatially and temporally. In the Aussie GRASS project, the NDVI imagery has been used to spatially fine-tune some of the pasture growth parameters. NDVI data are also being used with a generic algorithm to investigate optimization of model parameters such as transpiration use efficiency (Carter et al., 2000). Long-term mean NDVI data have been used to map tree density and cropping areas on a national basis (Carter et al., 1996; McKeon et al., 1998). In Queensland the Statewide Landcover and Trees Study (SLATS) is mapping tree density, tree clearing rates, and some land use with Landsat TM imagery for the entire state. Data from this project have been used to upgrade existing NOAA-based tree maps used in spatial models. The data are also being investigated for mapping land degradation. Research is in progress to translate mean NDVI and air temperature data into tree biomass data for Australia. See <http://www.LongPaddock.qld.gov.au/RainfallAndPastureGrowth/ Qld/> (The Long Paddock Satellite Imagery) and <http://www. LongPaddock. qld.gov.au/SatelliteFireMonitor/>. In a NASA-sponsored program titled "Use of Earth and Space Science Data over the Internet," Diak, Bland, and Mecikalski (1996) developed a suite of products for agriculture that are based on satellite and conventional observations, as well as state-of-the-art forecast models of the atmosphere and soil-canopy environments. Earlier attempts to apply satellite data to agriculture were plagued by data and information difficulties, which made the information systems problematic and unreliable. This situation has changed, however, and the timely retrieval of the multiple near-real-time satellite and supporting data sets required for routine use by agricultural applications is now feasible. This will become increasingly so with future availability of such data on the Internet. Similarly, dissemination of the resulting data and analyses to end users is now possible via the Internet, satellite-based commercial data transmission services, and telecommunication services. In the TiSDat (Timely Satellite Data for Agricultural Management) project, Diak and colleagues (1998) selected agricultural sectors in which data availability was thought to be hampering the full adoption of currently available knowledge to management decision making. These applications were also selected based on the availability of some form of decision framework that could be improved through the application of satellite data and modern computer modeling techniques. The crops initially targeted for decision support systems were of comparatively high economic value, and the associated growers were motivated and well organized. In each area selected, the use of an improved information base had the potential to have a positive impact on environmental quality. The products included an irrigation scheduling product based on satellite estimates of daily solar energy, a frost protection product that relied on prediction models and satellite estimates of clouds, and a product for the prediction of foliar disease based in satellite net radiation, rainfall from ground-based measurements, and a detailed model of the soil-canopy environment. quality estimates of incident solar energy at the surface required for evapotranspiration estimates with much greater spatial detail and cost effectiveness than can be achieved through a network of ground-based pyrano-meters. Usually, eight to twelve individual U.S. series of Geostationary Operational Environmental Satellites (GOES) images are used during the course of a day, at hourly intervals, to make instantaneous estimates of the solar energy conditions at the satellite image times. These estimates are then integrated over time to provide daily estimates of solar energy at a site. The model used to estimate solar energy was similar to that described by Diak and Gautier (1983), but modified for the newer generation of GOES satellites (GOES-8 and GOES-9) (Diak, Bland, and Mecikalski, 1996; Menzel and Purdum, 1994). Geographical maps of estimated insolation and evapotranspiration are produced every day during the growing season (<http://www.soils.wisc. edu/wimnext/water.html> and <http://cimss.ssec.wisc.edu>). Ready access to real-time satellite and surface data and forecast model predictions of minimum temperature can lessen frost damage, improve harvests, and reduce the use of water applied to prevent such damage. In Wisconsin, cultivated cranberries are the major frost challenge. Any improved information on impending frost conditions can aid in minimizing water usage and the resulting environmental and energy impacts. The minimum temperature forecast system relies on a combination of satellite cloud information and synoptic upper-air and hourly surface measurements of temperature, humidity, and wind speed. Several computer forecast models, based on the physics of the atmosphere and land surface, as well as a statistical adjustment procedure, are used to interpret the data sources and predict if freezing temperatures will occur overnight. Satellite-derived cloud data are assimilated into the University of Wisconsin-Madison Cooperative Institute for Meteorological Satellite Studies (CIMSS) Regional Assimilation System (CRAS) run in near-real time, with a forecast duration of 48 hours. A time series of prognostic information on the air temperature, humidity, and wind speed of the lower atmosphere and also downwelling thermal radiation is passed to a one-dimensional soil/vegetation model, called the Atmosphere-Land Exchange (ALEX) system. The CRAS-ALEX prediction provides the first estimate of temperatures for the day and is generally available at about noon local time. In the evening, several updates are made using timely satellite-derived cloud information and also surface-based measurements. Real-time 10 km satellite-derived cloud cover from the GOES-8 atmospheric sounding instrument are provided to the TiSDat effort through the cooperation of the National Oceanic and Atmospheric Administration Advanced Satellite Products Project at the University of Wisconsin Space Science and Engineering Center. Daily real-time cloud products are viewable both on the CIMSS and NOAA Web sites (<http://cimss.ssec.wisc.edu/> and <http://www.noaa.gov/>, respectively). The last product involved foliar disease in potato, and it depended on a decision support system named WISDOM developed by the University of Wisconsin-Extension, which resided locally on growers' home computers. The threat posed by this type of disease depends significantly on temperature and humidity within the crop canopy and the presence of free water on leaves (Stevenson, 1993). Growers interfaced WISDOM with a server to obtain rainfall, meteorological data, surface radiation inputs, and canopy model output required by WISDOM for the blight models. Use of the early blight model within WISDOM reduces the number of fungicide applications used compared to conventional practices. The TisSDat product for this application uses satellite, surface, and radar data inputs, coupled to a version of the ALEX adapted to potato, to provide WISDOM with the data required by the blight models. The relevant data sets include satellite-based hourly estimates of solar radiation and net longwave radiation, as well as surface-based measurements. Further details about these three applications and additional references can be found in Diak and colleagues (1998). Light from a single ground-resolution cell. Schematic diagram of the basic elements of an imaging spectrometer. Some sensors use multiple detector arrays to measure hundreds of narrow wavelength (k) bands.